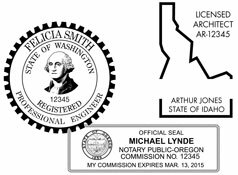 We can customize professional stamps for all 50 states. Some states and professions have more than one approved design. If you have a specific design in mind, please provide an example with your order to ensure you receive the design you want. Some states require you to submit a copy of your certification or license with your order. Please check your state's regulations prior to ordering. Need assistance? Give us a call at 253-383-5433 or e-mail customerservice@tacomarubberstamp.com.